We do not call this a chakra necklace to capitalize on the commercial appeal of the subject. Much research from vedic history and what the ancient rishis have explained has gone into how we have designed this Chakra necklace. Just having a necklace with colorful beads does not mean that it will in any way strengthen the chakras resonance for planetary stimuliand as such a lot of chakra jewelry out their has little do with chakra balancing. The result is a beautiful necklace that can be tossed over the head that has an exceptionally wide skin contact area for transferring the benign Electro-magnetic radiation. It is both comfortable and attractive and can be used as a mala as well. The electro magnetic radiations that the body will absorb via the crystals are chakra balancing. Any Ayurvedic astrological crystal that has been recommended by the rishis in the ancient vedic texts can also be considered a chakra crystal or chakra stone. What is mostly being promoted today as chakra stones are just materials that are very easy to buy in bulk by wholesalers and are being ruthlessly promoted by new age purveyors to attract income. As commonly calculated today, an astrological chart is drawn for a person according to the time and place of birth; even a slight inaccuracy in this data affects the accuracy of the chart. Further, one is actually 'born' at the moment of conception, when the soul enters the first cell of its new body. One's karmic pattern has already begun to unfold in that instant. The intuition of wise men, such as my guru Sri Yukteswarji, who was masterful in astrology as the divine science it was intended to be, knows how to factor this "birth at conception" into calculating a horoscope. In any case, it is not the stars themselves that control the happening in man's life but rather his individual karma that, when ripe for fruition, is affected beneficially or adversely by the electromagnetic vibrations of the heavenly bodies. The reaction of the stars to the human body and mind is very subtle. The astral forces radiating to the earth from the heavens interact with those in the spinal centers that sustain man's body. Ignorant man does not realize how body and mind are changed though his good and bad actions, and how his actions affect - positively or negatively - the centers of the spine. Persons whose bodies and minds and material environment are out of order, the result of transgressions of spiritual law, have inharmony between the energies of the spinal centers and those radiating from the twelve signs of the zodiac. The true science of astrology, therefore, is mathematics of one's own actions, not the mathematics of the brainless stars. Karma governs the stars and one's destiny, but karma is governed by one's willpower. What is to be does not necessarily have to be. Man's free will and divine determination can change the course of events in his life, or at least mitigate adverse aspects. One whose body and mind are very strong is impervious to adverse astrological influences: there may be no outwardly observable reaction at all, even when evil vibrations may be radiating from negative configuration of the stars. But if body and mind have been weakened by wrong eating, wrong thinking, bad character, and bad company, then the stellar rays have the power to activate latent harmful effects of past karma. On a cosmic scale, the combined karma of groups of individuals - social or racial groups, or nations, for example - or of the world at large, constitute the mass karma of the earth or portions thereof. This mass karma responds to the electromagnetic vibrations of the earth's cosmic neighbors according to the same laws that affect each individual, thereby inducing beneficial or malevolent changes in the course of world or natural events. A store of good mass karma from living in harmony with divine laws and forces blessed man's earthly environment with peace, health prosperity. Accumulated bad mass karma precipitates wars, diseases, poverty, devastating earthquakes, and other such calamities. During times of prevalent negative vibratory influences, the individual must thus contend not only with his personal karma, but also with the mass karma affecting the planet on which he lives. Horoscopes tend to influence and paralyze the free choice of man's inherent divine will-to-conquer. Further, intuition is needed to read correctly the messages of the heavens and to interpret their significance in relation to one's individual karma. For guidance and support it is far better to appeal to God and His angelic agents. Why look to the mute stars? From them man can receive neither sympathetic response to his plight, nor personal succor in the form of divine grace. When one is following God's path, to give too much thought to such lesser sciences as astrology is a hindrance. The highest way to create the right influences in one's life, the yogi's way is to commune with God. All stars bow down before the presence of God. By meditation the yogi reinforced the positive spiritual power in the cerebrospinal centers that are acted upon by the planetary influences. In this way, the yogi harmonizes body and mind with the universal laws and God's divine cosmic agents who govern them. Taking the liberty to analyze his sage words: our real horoscope is in the chakras and the paper horoscope is but a written reflection equating our karmic strengths and weakness to planetary stimuli indicating when those tendencies are likely to manifest. Because of our past actions and thoughts we may have weakened our receptivity to the benign recipe of planetary radiations and thus we may suffer the consequences. If we haven't strengthened our karmic matrix through living a physically, mentally and spiritually strengthening life, then our destined weakness will not be greatly counteracted. We are influenced more by these remotely pervading radiations if we are not as strong as we could have chosen to be. In other words, a strong body and a strong mind can sometimes be totally unaware of the pre-programmed weaknesses (negative karma) we have set into motion. To blame the stars and not our own pre-disposition to absorbing their helpful and essential radiations is as absurd as not realizing that the planets are in the same place for everyone, every day, and the differing reaction to them is from within us and not from the paper horoscope. We are far more dependent on the cosmic pranaaround us and its recipe of electro-magnetic rays with which our electrical bodies need than we realize. Just as there are many essential vitamins and minerals in food for excellent health and different rays of color in health giving sunshine, so there are different benign planetary radiations that we absorb and benefit by. These radiations are a catalyst for programming the healthy "body/mind electric" and when our chakra receptors are not able to absorb these needed planetary "vitamins", the mind and body will go further out of harmony and consequently malfunction in relation to the lack of stimuli. Certain Ayurvedic gems have a similar harmonic electro-magnetic radiation to the planets and hence can, as "electro-magnetic vitamin supplements," enhance our required dosage of this beneficial and essential electro-magnetic planetary stimuli. I use the words "vitamin supplements" to graphically assist the reader to understand that when a planet is supposedly taking an unfriendly interest in you, it is merely your inability to digest or receive the planet's pranic radiation. Your receptivity can be such that if it is placed in a negative transit, your chakras' interpretation and receptivity of its energy can be diluted or tainted. Hence the wearing of a gem will increase the available dosage of a similar radiation acting like a needed supplement to your electro-magnetic system. In order for the subtle rays to be absorbed, the gems must have very good skin contact. They also obviously have to be big enough to make a difference and clean enough to act as effective transmitters of the radiations that are naturally a part of their atomic matrix. Though this idea seems quite radical to conventional thought, only a little reflection will allow us to realize how greatly we are influenced by the moon, sun spots and planets. Even our environment can greatly affect our thoughts, uplifting or depressing us, and yet are not the planets also tangibly potent enough to be a pervasive background influence? Only a little observation is needed to see how our friends seem to be sharing a similar pattern reflected in the planetary positions when one studies astrology! And hence we seem to be playing with a double edged sword; on the one hand the planets are dictating to us, such as when a friend inexplicably gets cancer after having been living healthily for years. On the other hand, we are advised correctly that we can overcome our stars by wisdom and will power. Both perspectives have their place in creation. To see life as a servant of truth rather than an unwitting slave to its consequences is the much wiser route. Even if beaten by karmic circumstances, one has only lost when one has given up trying to overcome karmic weaknesses that keep us from our higher nature. It is easily apparent as one observes the development in the conventional medical sciences that the future of medicine is in the rays. Rays are any form of vibratory energy, from sound, color, radiation etc., and can be of a harmful type or greatly beneficial. Medicinal chemistry can only struggle to stimulate the life-force back into the ailing patient. Rays can go much deeper into the cell tissue and enhance the rejuvenating process. Gems are but one of the methods of dispensing subtle yet benign rays. Although the study of gems is many years ahead of the conventional learning curve, they will eventually be treated with respect when the hocus pocus side of the field is less prevalent. The body can be better understood as an electromagnetic system - that is, an intelligently coordinated network of oscillating, vibrating parts. A little discrimination may convince the reader that assisting their electromagnetic signature, or way of being, with the use of Chakra or Ayurvedic gems or metals would be an intelligent and easy way of lessening the karmic weaknesses in receptivity. 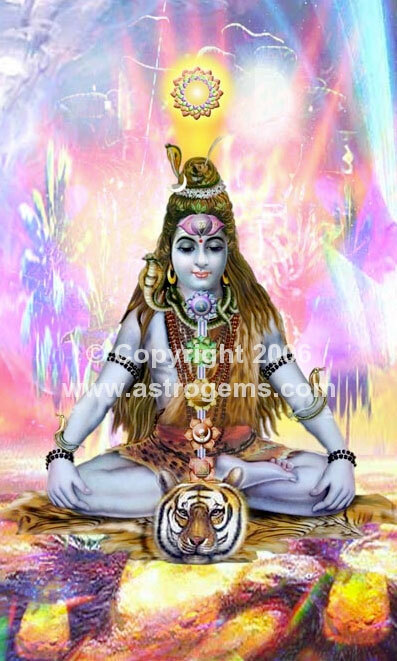 As Swami Sri Yukteswar has suggested, plants, metals and gems can all play a role as instruments to minimize or nullify the adverse effects of our reactions to planetary radiations. Of the three, he extolled quality gems of over two carats as being the most effective. This, however, does not negate the excellent strengthening benefits of pure gold, silver and copper bangles. Of interest, Swami Sri Yukteswar and Paramahansa Yogananda both wore nine-gem bangles or true Chakra bangles as they have been called today. For more explaination by the rishis please click here. Because there is tradtions of experience going back 5000 years in what the best gemstones are for the most effective genuine chakra crystal necklace or chakra healing bangle. And because many individuals do not have the inclination or finances to purchase a more powerfull chakra or navaratna bangle some would like to cautiously investigate to see if the principle is sound, based on their own experience. One way to do this is to wear a high quality chakra (navaratna) necklace that is designed and made by Astrogems that has over 20 exclusive research and experience specifically with regard to chakra healing or karmic mitigation jewelry. Having made more nine-gem planetary bangles with gems of over two carats than anyone else in the world, we wish to continue our "quality at a great price" reputation. I have personally selected the uncut gem material for cutting and I have overseen the process of cutting for shape and correct weight. The result is a beautiful necklace that can be tossed over the head that has an exceptionally wide skin contact area for transferring the benign Electro-magnetic radiation to the chakras. It is both comfortable and attractive and can be used as a mala as well. We will accept chakra necklaces back at a full price trade in on a navaratna arm bangle should the person want to head in that direction based on their personal experience with the necklace. Having analyzed many so called chakra necklaces over the years, I have always found that the quality, gem selection, and design of these necklaces have been unacceptable representatives of this wonderful science. It is because of this that the world is not that impressed by them and they have not become popular. Ideally the necklace should be so powerful that the wearer should actually feel calmer and stronger from receiving the interchange of resonance with the gems. It is a great blessing to have an opportunity for the electrical body to receive the supplement of subtle energy from the gems. I have never seen a good chakra necklace made with the understanding that you can scrimp on bead size and save money. I spent several weeks in India working on this project. India is where the uncut material was faceted for the necklace. It had to be selected and analyzed for approval and then bought in quantities to make the project viable. Finding high quality green peridot for large beads, for example, is not an easy task. Gems have limitations and it is the size of the gem that is so crucial for this subtle energy to make a difference. It is crucial that this energy be available in a quantity that can make a helpful shift. So many gem instruments simply are too small and thus too subtle to make a difference. For years at Ayurvedic Astrological Jewelry, we have tailored our gem instruments based on feedback and not necessarily on what the many and often contradictory traditional suppositions have related. It is very necessary that each bead is over two carats. Most I have seen haven't even come close to being one-carat in weight. It is essential that the gem beads are clean and not fractured. Most I have seen are not of this nature. It is worth pointing out here that I have never heard negative responses from people wearing these inferior necklaces such as one would presume from statements made by many gem purveyors who have a self-interest in selling such astrological gems. All that I have discovered is that the wearers dont seem to have noticed an appreciable difference in their life since they have been wearing them. Everything we sell at Ayurvedic Astrological Jewelry has a ten-day, no questions asked money back guarantee and this includes the necklaces. Obviously we like feedback, so what I mean by no questions asked is that excuses are not requested. Years ago I often made a sale of a chakra by selling a coral necklace to a half skeptical customer who would be amazed enough to want to investigate the process further. By rationalizing that if they could have such a pleasant shift with a necklace (alleviation of colds, lung congestion, feeling the cold etc. 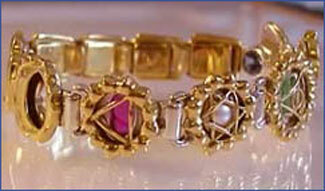 ), then wearing all nine gems would be considerably more effective. Though obviously the selling of such necklaces could work against me by taking business away from the nine-gem bangles, my theory is that it will open more people up to the blessings of an Electro magnetic instrument, just as the coral necklace has. 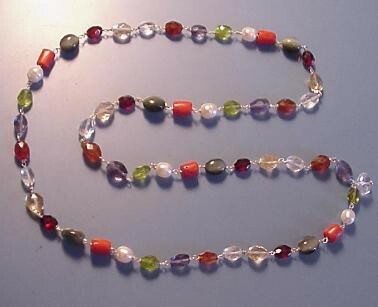 The stones on the chakra necklace are as follows: Hessonite garnet, blue Iolite, Peridot, freshwater Pearl, Red Coral, Silver Quartz Catseye, Almandine, Citrine and White Topaz. A brief explanation of how I have chosen the gems to replace the primary planetary gems is as follows: The most powerful gem in the mineral kingdom, based on my observation of hundreds of clients, is the diamond, followed by the sapphires. My conclusion leads me to suspect that the harder the gem, the more lifeforce it emanates. Obviously when one considers that the rishis recommended for the most part the hardest gems of the mineral kingdom, it would seem more than coincidental that this conclusion is correct. The Diamond, the Ruby (which is a red Sapphire), the Blue and Yellow Sapphire, Chrysoberyl Catseye and Emerald are all in the top five percent of hardest gems in the mineral kingdom. The Pearl and Coral are organic gem forms and the Hessonite Garnet seems to be the exception to the hardness rule. The next consideration is that it is of no benefit to wear a ruby or blue sapphire if they are not eye clean at least, and ideally loop clean. Hence I have had to reject, for economic reasons, the rubbish material offered in India for emerald, ruby, blue and yellow sapphire beads. In their place I have selected from the rough uncut crystal material: Blue Iolite for the Saturn influence. The gem is often offered by less educated gem sellers as blue sapphire because of its very similar appearance. Almandine garnet is used in the place of ruby. This has a deep pigeon blood red color, but is a thousandth the cost of natural ruby of the same color and clarity. White Topaz is the Venus substitute for the diamond. This is the hardest clear material offered in beads of over two carats I could find, and it is much harder than Quartz. Peridot is the substitute for green emerald . Most emerald is oil treated to hide the multi-fractured nature of this lower grade bead material. Peridot is a great crystal but more expensive than the other beads as a substitute. However it is much better than eye clean . All the gems are eye clean except some of the hessonites. Citrine is the substitute for the Yellow sapphire gem, Silver quartz catseye replaces the chrsoberyl catseye. All the other gems are the original primary gems. As part of my research, I have had many friends in the neighborhood test run these necklaces for detailed feedback. A very high number insist on buying the one they borrowed. As with all my gems I have first researched the response from a large number of individuals to gauge if the books on the subject are based on experience or hearsay. Sadly so many books on the subject are a bit like these recipe books that copy the recipe from one book to another and don't really research the cooking part that deeply. Yet when people read books they so often seem to think the author is an authority, even though they have not sold thousands of gemstones and spoken in depth with the follow-up part of the process. I also encourage individuals to read this essay on how gems can influence our lives, which is the most scientific study on the matter that I have been able to compose. It is strictly intended to avoid the blind faith so often associated with this science. Because vedic astrology is such a profound science and because of its relative ease in communicating profound insights into a person's past and future, many people develop an excessive respect for the astrologer's gem recommendations. Repeatedly people contact me via the web or phone and tell me that a series of very good astrologers all gave them very different gem recommendations. When they asked these astrologers about my services, they were enthusiastically directed to another gem dealer, but the individual was not told that the gem dealer paid them secret commissions for their referrals. This is so common that it is epidemic in my view, in both India and America. To err is human, but this is another reason why I favor judicious, economic rationale in acquiring as many of the different benign electromagnetic radiations that different gems can relay. The important thing is that the gem instrument is balanced and powerful enough to make a difference. I achieved this through years of research, balancing cost effectiveness with the desired result. Because I travel to different gem sources around the world, I also acquire the most exclusive gems as well. But they simply aren't always affordable for many; hence the Chakra necklace is a balanced way to explore this arena. The Chakra Necklace comes in two standard lengths: The cost is $440 for the 54 bead (26 inches), and $720 for the 108 bead (52 inches). We can also custom make a necklace to the length of your preference. To order a custom length, please contact us. Order the 54 bead Chakra Necklace for only $440 plus shipping. To order the 108 bead Chakra Necklace for only $720 plus shipping contact us. This website is on a secure server. Please see our Security Guarantee.